The filling level sensor continuously monitors the level of the material dispensed and ensures that the storage tank is exchanged in time. 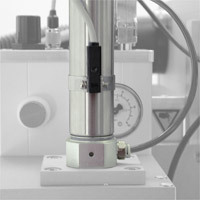 A magnetic sensor detects the piston position of the pneumatic cylinder, which exerts preliminary pressure on the dispensing material. Once a previously defined position has been reached, the sensor gives a signal indicating that the cartridge is to be exchanged soon.